APM is happy to announce the category winners of the APM Project Management Awards 2017, sponsored by RPC UK Ltd. The awards recognise the very best the profession has to offer – from aspiring young project managers to experienced project professionals managing complex projects and programmes both in the UK and overseas. This year there was a broader choice of categories in order to give a wider range of projects, programmes and professionals from diverse sectors the opportunity to enter and display their achievements. 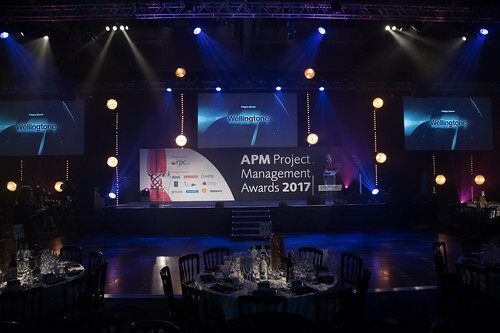 Celebrating project management excellence for over 20 years, the glittering APM Awards ceremony was held on Monday 20 November 2017 at Old Billingsgate. John Pienaar is deputy political editor and presenter of the weekly Westminster round-up Pienaar’s Politics on Radio 5Live. A seasoned reporter, he sees his job as beating a path through the forest of Government rhetoric. Ever since his original, often controversial parliamentary sketch for the Independent, he has acted as tour guide and translator of goings-on in the Westminster village. John originally trained at South London Press and later became an Old Bailey Correspondent. Instantly recognisable to television news audiences, John has spent hundreds of hours standing in the rain outside 10 Downing Street. John follows a string of high profile personalities who have hosted the event in previous years, such as Kate Silverton, Justin Webb, Steph McGovern, Fi Glover, Chris Hollins, Angela Rippon, Bill Turnbull, Adrian Chiles and Andrew Castle. David Cross - Rolls-Royce plc. The 2016 awards ceremony, hosted by TV new presenter and journalist Kate Silverton at the London Hilton on 7 November, saw Royal Mail scoop the coveted Project Management Company of the Year, with Heathrow claiming Programme of the Year and the Metropolitan Police, Project of the Year.